The best straight-up action movie since Taken, this one has style and excitement around every corner. This is a cool action movie. it doesn’t go much further than that, and that’s not a bad thing. the storyline is a pretty obvious and straight forward revenge thriller. the character getting revenge is a long retired hitman. this sounds like something we’ve seen a thousand times before, only it isn’t. that’s because john wick exists in a world of hitmen who all know each other, have secret codes, and have secret clubs. the continental hotel where wick stays is one of most interesting things about the movie, as it is sort of an exclusive safe haven for hitmen. and then there’s the action, which is pure energy and fantastic choreography. the movie does lose a little steam towards the end, but for the most part it is a great sucess. John Wick is a badass action movie that knows the formula for how to do this genre right. there are only two things that matter in an action movie, and they both go hand in hand. those two things are the stunt choreography (basically the action itself) and the look of the scenes. everything else falls into the category of helpful, but unneccessary. these things include the plot, character development, dialogue, and music. john wick gets some of those right (certainly the music), but since it already nailed the things that matter most (creative action), everything else is just gravy. the reason why this movie seems to be so well put toghether is because it was directed by two stunt choreographers who have been students of the genre for years. these were the guys who made all of keanu reeves’ stunts work in the matrix. stunt choreographers aren’t necessarily great directors, (just look at yuen woo ping, who directed tons of movies, but only had one good one, iron monkey.) but at the very least, they should get the action right. john wick does that and then some. part of why this movie works out so well is because it’s got a very generic plot, that we’ve seen a thousand times before. now that last sentence probably doesn’t make any sense at first glance. why would seeing such a formulaic film be a good thing? for these directors, it’s good because they can build off what others have done in the past. they know full well what works and what doesn’t work for this type of movie. john wick takes the best parts of other films with this kind of plotline, and assembles them all into one movie. 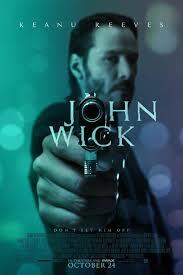 the story has wick seeking revenge against tons of mobsters and their armies of hitmen. there are whole actors who have made careers (or career resurgents) out of movies like this. liam neeson and denzel washington are two of them. from death wish to the crow to the punisher, this is probably the single most common type of action movie out there. and yet it still works if handled correctly. john wick is a movie that proves that. so what does this movie do that is so right? It creates a new world. the movie creates the world of the known assassin. the unknown assassin has no world. we’ve learned that from movies like the replacement killers and assassins, where he’s a loner who just takes contracts and keeps to himself. but the known assassin is something that we haven’t really seen much of before. a guy who is so notorious in the world of hitman, that he is a legend who people tell stories about, and recognize wherever he goes. at the start of the movie we see wick experiencing flashbacks of his wife dying. they were out on a pier one night and she just collapsed, right then and there, into his arms. his wife was very sick, and it was only a matter of time. from there we see the funeral, where marcus (willem dafoe), an old friend shows up, just to check in on wick and make sure he’s doing alright. the next day a cage arrives via delivery service and it contains a cute, little dog. the cards tell wick that it’s from his wife, who bought him the dog before she died, to help him grieve and keep him company. when wick takes a vintage car of his out for a spin and pulls into a local gas station, there are some younger guys there, standing around, with eyes on the car. one of them, iosaf (alfie allen, better know as bailan greyjoy from game of thrones,) wants to buy the car and wick tells him it’s not for sale. we know we haven’t seen the last of this guy. that night he and his buddies break into wick’s house, beat him up, steal his car, and kill his dog. 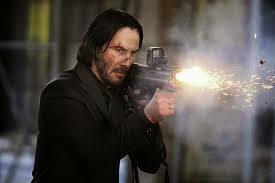 when wick wakes up from being unconcious, he knows what he has to do. it’s vengeance time. the kid who did the killing is the son of a big time mobster who wick used to work for. the gangster calls wick to try to smooth things over, but there’s no bringing his dog back and wick is after the guy who did it. the gangster knows that, and so he disbatches an army of men to go to wick’s house and kill him. they break in, and wick takes them down one by one. if he had any doubt about whether or not to get back in the game, this scene made him leave the doubts at the door. just killing again feels so right to him that he realizes how much he missed it. regarding the world that this movie creates, it pretty much gets started here, after wick has killed these men who came to his house. he calls a cleanup delivery service, which turns out to be a lot more than just body removal. then he checks into a hotel for assassins. they know him here, from the old days, and everything needs to be paid with by gold coins. there’s even a club down in the basement, where the hitmen go to socialize. this hotel and club are called the continental, and there is only one rule while there. no killing. that rule gets broken. from the hotel room action scenes, we go to another club where wick chases after his man. he gets attacked by about a thousand bodyguards in the process and it’s some of the greatest movie action that’s come out in a while. there was a lot of talk about the movie the raid 2 earlier this year, and how cool of an action movie it was, but after seeing both that film and john wick, it’s hard to know what all the fuss was over. wick has got that movie beat hands down. the action and settings are all superb. now the movie does start to lose it’s edge a little towards the end. the killing of the guy who was wick’s target the whole movie isn’t handled well, and neither is the boss’ number two man. we end with a rainy night out in the open situation, much like the end of jack reacher, and the movie would have been better off keeping to cool indoor settings. still, up until those last few moments, where things gets a little lost, this is a pretty dynamite action film.